This is not what the doctor ordered to get the Red Sox out of their slump. 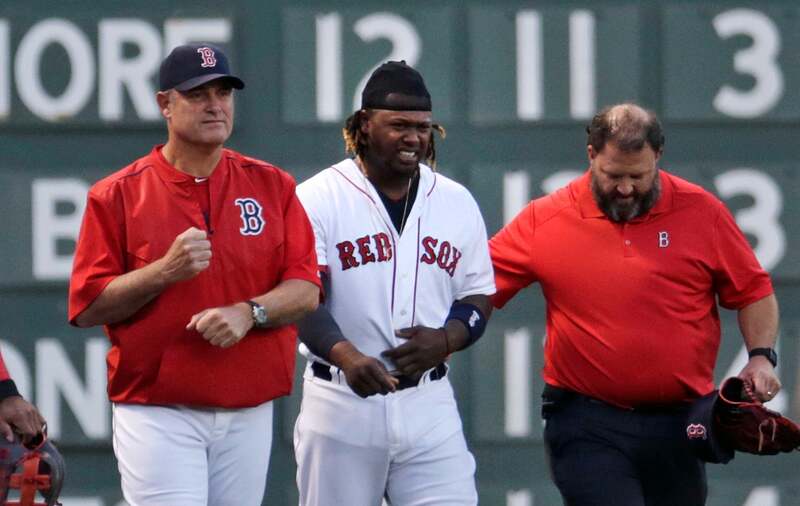 Left fielder Hanley Ramirez suffered a sprained left shoulder crashing into a side wall while attempting a running catch in Monday night’s game against the Tampa Bay Rays. In the top of the first inning, Ramirez ran down a line drive to left off the bat of Rays first baseman James Loney. Ramirez appeared to make the catch, but the ball popped out of his glove with the crash. Visibly shaken up on the play, Ramirez was removed from the game. After Boston’s 5-1 loss, Red Sox manager John Farrell said Ramirez’s status was day to day. Allen Craig came on to replace Ramirez in left. Entering the game, Ramirez led the Red Sox in home runs with 10, RBIs with 22 and OPS at .949. His .283 batting average was fourth on the team. From 2011-14, Ramirez missed an average of 46 games a season with various injuries. Ramirez, while playing for the Marlins, had surgery on his left shoulder in 2007, and again in 2011 to correct instability.